While no one can argue that µTonic stands strong on its own, adding effects to it certainly brings out other dimensions in its sound; effects such as CamelPhat and CamelSpace, developed by Ben Gillett of Camel Audio. Plug-ins that are designed with a similar philosophy to µTonic of putting creativity and usability in focus. Ben and I have decided to honor each other's work by giving our customers an opportunity to buy our products for a significant discount. 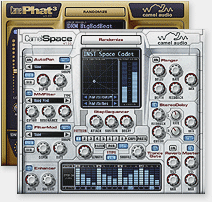 As of today and until April 10th, existing and new Sonic Charge customers are granted 25% discount not only on CamelPhat and CamelSpace, but on the whole Camel Audio product range, including Cameleon 5000, the Biolabs Absynth Sounds and the PhatSpace and Complete Camel bundles. Existing customers will receive an e-mail containing instructions on how to take advantage of this offer (in case you do not receive this e-mail, contact us through the support form). New µTonic customers will receive the instructions in the registration information sent from share-it! after the purchase. To demonstrate that µTonic serves even cooler dipped in a little bit of Phat and Space we have prepared a couple of clips for you. The tracks were created using Sonic Charge and Camel Audio software only.